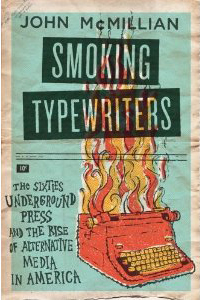 Congratulations to Dr. John McMillian on the publication of his new book, Smoking Typewriters: The Sixties Underground Press and the Rise of Alternative Media in America. How did the New Left uprising of the 1960s happen? What caused millions of young people- many of them affluent and college educated-to suddenly decide that American society needed to be completely overhauled? The Library’s holdings of Dr. McMillian’s publications can be found here. Dr. McMillian is a founding editor of The Sixties: A Journal of History, Politics and Culture and is at work on Beatles Vs. Stones: The History of a Legendary Rivalry (Free Press/Simon & Schuster). He has been an assistant professor of history at Georgia State University since 2010. The Special Collections and Archives Department of Georgia State University’s Library will host Dr. McMillian for a book talk on Friday, March 11, 2011, from 3:00-5:00 (Library South, 8th Floor). The event is free and open to the public; books will be available for purchase at the event. Please contact Traci Drummond for more information (404.413.2880, tdrummond@gsu.edu). This entry was posted in Communication, Faculty Publications and Research, For Faculty, For Graduate Students, For Students, History, Sociology, Special Collections & Archives. Bookmark the permalink. congratulations with the new book! i hope it does well and do justice for our current press media today.